"...And then from the lofty shores of Space-C, the infinity crabs scuttled with their evil pincers made out of the colour blue!" The Doctor sat back, taking a deep breath. "Whereupon the Nightmare Phone dialled into the First Words and used their powers to..."
"Slow down, I'm not getting this!" Across from the Doctor, his ornate robes pushed unceremoniously into the plastic diner seat, the mighty Time Lord President Rassilon sat, scribbling frantically away at a napkin. His burger lay before him half-eaten, forgotten in the epic transcription that was going on. The Doctor scowled. "Stop interrupting! I'm on a roll! Now, where was I..." He pondered this. "Oh yes. The First Words shattered the Helm of Saturn-5, and from that hyperworld hatched the Cyber-Spectres!" "Ooh, that sounds good, what are they?" Rassilon looked up for a moment at the Doctor. The Doctor shrugged, stealing a chip. "Eh, I dunno. Evil Cyberman ghosts? Whatever. The important thing is that the... the..."
"Baby-faced babytron!" boomed a voice, as another ornately robed figure came to join them. It was Omega, the mad Time Lord god and inventor of time travel, clutching a red plastic tray upon which sat a Happy Meal. "And he shot babies out of his baby-head!" 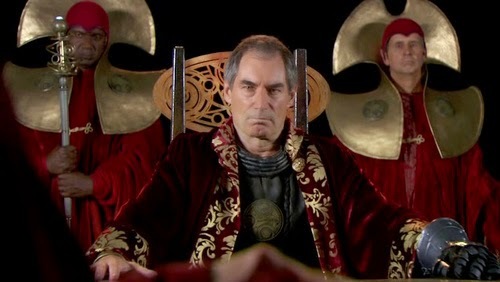 Rassilon scowled. "That's crap, Omega. Stop being crap." "It sounds better than 'Cyber-Ghosts'," Omega pouted, pushing a soggy french fry into his helmet. "What about 'The Nightmare Banana'? The twist is that it's actually an orange!" "No!" The Doctor slammed his fist onto the table. "We talked about this before. The Time War has got to sound cool! It can't sound stupid, it's got to be full of mad stuff - " He raised a hand to stop Omega from replying. "Cool-sounding mad stuff!" "Yeah," Rassilon slouched back and began to steal Omega's McNuggets. "Us Time Lords have standards. We can't have people finding out the entire Time War was just some Daleks shooting stuff." The three friends sat back and laughed. Until, that is, when Omega discovered his McNuggets had mysteriously vanished into a black hole. Could the Thundercats destroy the One Ring?